1. To integrate the HoloLens with Trimble Connect, a collaboration environment for engineering, design and construction projects based on a Gehry Technologies software acquired by Trimble in 2014. 2. To integrate the HoloLens with Trimble’s Sketchup solution for creating, communicating and updating 3D model designs. 3. To weave HoloLens into the Trimble V10 Imaging Rover, an integrated camera system that captures 360-degree photos for documenting and measuring job site environments into data-heavy geospatial content. The prospect of having a Microsoft HoloLens device that could overlay digital models at a 1:1 scale in-situ had many in the architecture, engineering and construction (AEC) sector curious about how the partnership between Trimble and Microsoft would play out. Fast forward to the last week of January 2018, at World of Concrete and Air-Conditioning, Heating, Refrigerating (AHR) Expo, where Trimble announced the release of Trimble Connect for HoloLens, along with a new ANSI-approved hard hat. They made good on their promise from 2015, and Trimble Connect for HoloLens is available now through the Microsoft Windows App Store. Users can select the free trial option to enable integration with HoloLens. Paid subscriptions have higher functionality and Trimble will help these users attain precise on-site alignment. The Trimble Connect Hard Hat Solution is expected to be available for everyone sometime in the first quarter of 2018, though Trimble wouldn’t specify exactly when. Construction workers from one of Trimble’s clients (unspecified), use the Trimble Connect for HoloLens Hard Hat Solution on site. DAQRI, an industrial mixed reality startup, had been working on getting ANSI-certification for its Smart Helmet until it switched focus and created Smart Glasses. The lack of ANSI-approved hard hat with integrated mixed reality tech has been a strange and simple-seeming problem to overcome for getting the technology onto the heads of workers on industrial job sites. This missing piece of the puzzle was crucial to ensuring that mixed reality can grow from an experimental entertainment-oriented novelty into a technology with useful applications that improve productivity and efficiency of communication, or AEC workers and operations companies wouldn’t take it seriously. And why would they? At Future Decoded 2017, Microsoft said they were collaborating with a partner to incorporate HoloLens into a hard hat, but did not say it was Trimble. Why is this Mixed Reality development a crucial step forward for the AEC industry? By incorporating Microsoft HoloLens and its mixed reality technology into a practical unit for hands-free use on industrial job sites with ANSI approval, Trimble has set the stage for productive experimentation with industrial hands-free Mixed Reality applications on jobsites that require the highest level of safety precautions, like mining and construction. 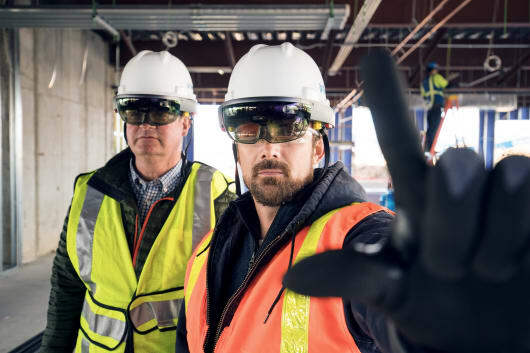 For the Trimble Connect Hard Hat Solution for HoloLens to be truly effective, pilot customers privy to early versions of the ANSI-approved hard hat with an embedded HoloLens set out to see how a team could use them to communicate more effectively. So as part of the pilot program and the impending offering of Trimble Connect for HoloLens, Trimble offers training and implementation support, which is crucial for early adopters of any technology. 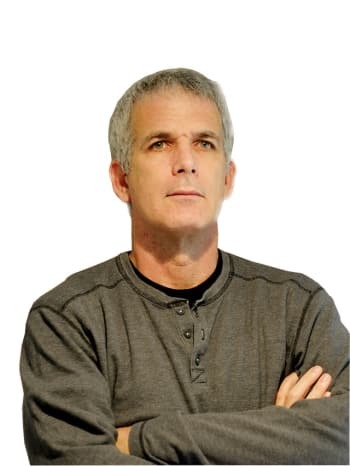 Aviad Almagor, director of the Mixed Reality Program at Trimble. To find out more about the collaboration, I had the good fortune of sitting down with Aviad Almagor, Director of Mixed Reality Program for Trimble to ask him some questions about the project and coming release of Trimble Connect for Microsoft. Eng.com: Trimble Connect for HoloLens has been in the works for a few years. Can you trace the evolution and trajectory of this Mixed Reality Project? Almagor: During 2016, our focus was on our customers and shaping the technology and our product based on the feedback. In 2017, the focus shifted to office space scenarios, where we were mainly supporting an effort to improve the efficiency of communication inside the office using mixed reality. Together with our customers this year, we are driving the integration of mixed reality communication from the office to the field. It’s really about enabling the on-site work and expanding our portfolio of use cases in construction and mining job sites. The demand to used Mixed Reality in the field is actually coming from the market. The hard-hat announcement together with Trimble Connect is really about enabling these kind of proprietary use cases, which require the use of industrial-grade hard hats. Eng.com: Now that there is a HoloLens embedded under an ANSI-approved hard hat, what area of market demand do you see Trimble Connect for HoloLens satisfying the most? Almagor: Some of the specific use cases in progress today are utilizing mixed reality to improve visual communication on-site. Being able to visualize BIM models and 3D models in mixed reality is critical to improving the efficiency of communication. You can see improvements in training sessions, quality control, production control, and even some assembly on-site in these use cases. Being able to digitally overlay exact 3D models at a 1:1 ratio on-site is critical to transforming visual communication in the field. 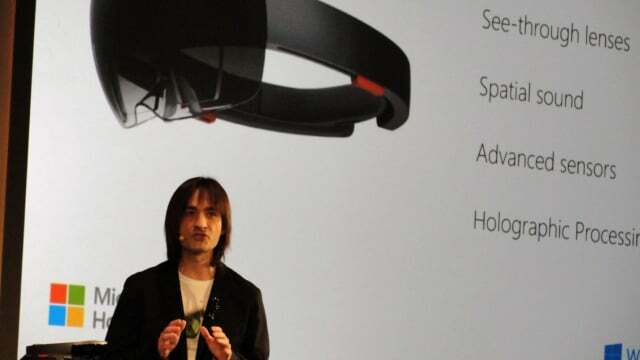 Eng.com: How did you approach combining the hard hat and the HoloLens device? 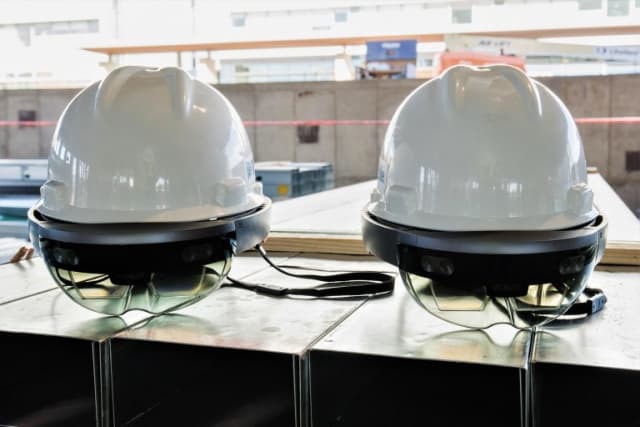 Almagor: We approached the hard hat project by attempting to identify a solution that would satisfy the market demand for mixed reality use on-site and satisfy the current safety standards for the headgear. We didn’t want to invent something from scratch, so we looked at what was out there, and attempting to combine the two pieces of equipment. We removed the inner ring of the HoloLens, we installed a standard hard hat connector, and we were in business. It was relatively easy and straightforward. Now, the construction workers and others who require the standard hard hat at their job sites. Now workers just put on the Microsoft HoloLens hard hat combination as though it were just a regular hard hat. Eng.com: Are there any challenges in bringing together BIM and mixed reality? Does the diversity of file formats have any effect on combining the two? Almagor: BIM and mixed reality have a great synergy. We do not have any challenges with the quality of the models. We support 90 percent of the file formats in the construction market, so the file format hasn’t really been an issue. It’s really about taking the content, regardless of file formats, uploading it to Trimble Connect with the construction manager solution, and it’s ready for use on the HoloLens. The main challenge today with the integration is the file size. But we cope with this in BIM 3D models for example, by realizing we don’t need to upload the entire model. We can segment larger files into smaller models, depending on what is on the docket for on-site construction crews on that particular day or week. I can open a Revit model, segment the content, publish it to the cloud, and users in the field can download it to HoloLens using Trimble Connect for HoloLens. A: What makes a particular industry attracted to mixed reality, and are you seeing interest and demand from for Mixed Reality in other industries outside of the AEC sector? Almagor: From our experience, mixed reality is attractive to industries that exist in a complex spatial environment. Ones that requires complex spatial data, such as architecture, engineering, construction or mining come to mind. There is similar interest and value in the medical sector, industrial design, and manufacturing as well. Though this is an important development for mixed reality, every new technology means a new learning curve for early adopters. Trimble is taking the time to help those in their pilot program and offer customization services for users who buy the premium subscription version, but every HoloLens device is already pretty expensive, ranging from USD $3,000 to $5,000. The use cases are compelling, but the lack of specific empirical benefits will likely leave many skeptical. But the technology is clearly improving, and when the Trimble Connect Hard Hat for HoloLens Solution is released sometime this quarter, it will be interesting to see who puts them on their workers. That being said, mixed reality is officially out of the office and on-site, which is clear progress toward making the benefits of using it clear to AEC companies.